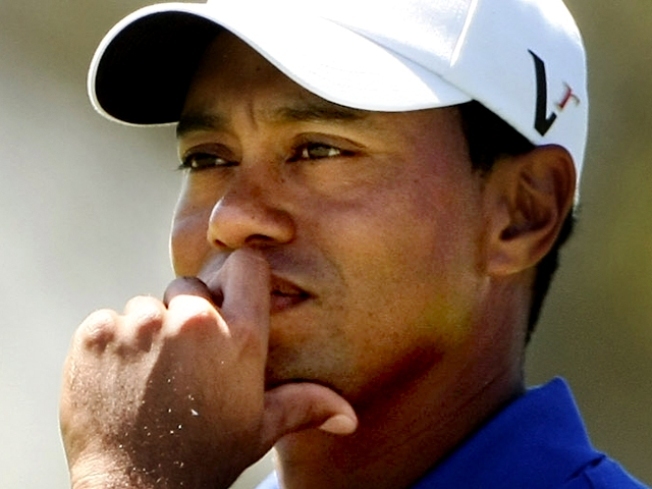 Tiger Woods has been put in a lot of difficult situations. Tiger Woods appeared in a colorful ad for Accenture in Monday’s Wall Street Journal. The headline reads: “The road to high performance isn’t always paved.” By the looks of things, neither is the road out of this latest mess. As it turns out, when you run into a fire hydrant in the manner that Woods did last week, you stand to spring a lot of leaks. Multiple sources who have known the golfer in either a personal or professional capacity have now come forward saying that news of trouble at home comes as no surprise. And then there’s Rachel Uchitel, the woman the National Enquirer named as being at the center of the controversy. Uchitel “wasn’t just talking about being with Tiger, she was bragging about it,” according to a source who spoke with Gossipcop.com. When the site pressed for comment, Uchitel responded, “Of course people will say that.” Like earlier statements she's made about any relationship with Woods, this falls into the “not exactly a denial” category. What’s next for Woods? He’s pulled out of his upcoming golf tournament, the Chevron World Challenge, due to injuries he sustained during the accident. Which is too bad. Being on the course and reminding people of why he’s really famous would be the best thing for him. Woods’ management never announces his schedule too far in advance, but the best bet for a “comeback” round is the Buick Invitational at San Diego's Torrey Pines in January 2010. Does Brangelina tell-all tell us anything? The new tell-all meant to blow the lid off the mysterious lives of Hollywood megacouple Brad Pitt and Angelina Jolie hits stands this week. Does “Brangelina: The Untold Story of Brad Pitt and Angelina Jolie” really tell anything we can believe? Author Ian Halpern, who recently penned “Unmasked: The Final Years of Michael Jackson” is said to have interviewed 900 people to come up with a real picture of the Jolie-Pitt relationship. Halperin’s main thesis seems to be that a split is imminent. Full disclosure: I have not read the book, but have read the excerpts released to the press at this point. And some of the excerpts don’t ring true, despite the extensive sourcing. For example, Jolie is apparently so controlling “she won’t let [Pitt] out of the house alone.” Any number of paparazzi shots showing Pitt sans Jolie prove this wrong. First, for a couple that has broken up so frequently, they sure do spend a lot of time together, or their breakups last for about as long as it take to be photographed taking your motorcycle out for a spin. Also, Pitt filmed “Troy” in 2003. According to interviews Jolie and Pitt both did during “Mr. & Mrs. Smith,” the couple met during filming of that movie, which began in August 2004. So this information from a source in 2003 makes no sense. “Brangelina” might turn out to be a fun read, but it’s probably wise not to take it too seriously. Alec Baldwin is planning on quitting acting. But not before he hosts the Oscars and ends his run on “30 Rock,” according to an interview in Men’s Journal. “I don't have any interest in acting anymore” he said. When his “30 Rock” contract is up in 2012, he won’t be seeking out any new television jobs, and movies are out, too. "Movies are a part of my past. It’s been 30 years. I’m not young, but I have time to do something else,” said Baldwin, who is 51.